In 1848, revolutions broke out all over Europe, and even in some parts of Latin America. Over 50 countries were affected. But everything remained quiet in Great Britain. 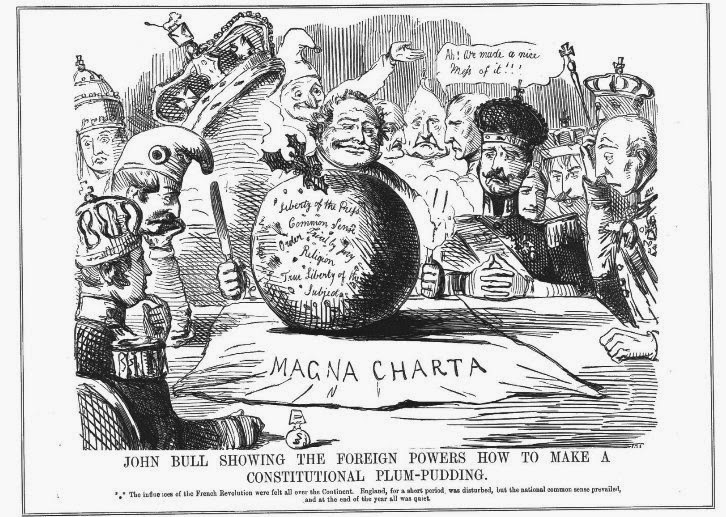 A cartoon published in an edition of Punch, and titled “John Bull Showing The Foreign Powers How To Make A Constitutional Plum-Pudding,” explains why. The picture shows John Bull sitting proudly at a table, with a fork and a knife in his hands. In front of him, the Magna Carta is laid out as a table cloth. Upon it, there’s a plum pudding inscribed with English values: Liberty of the press, Common sense, Order, Trial by jury, Religion, and True liberty of the subject. European and Asian sovereigns look on, with sad and even skeptical expressions on their faces. The shape of the pudding is not casual either. It’s round, like that of a globe. John Bull, with his knife and fork, is boasting of his ability to carve up the world as he likes, while the other crowned heads stand by and watch on, without being able to do anything about it. Therefore, the cartoon is also a celebration of the British Empire and the British identity.